Continued: This is page two of my long term review of the Garmin 1390 and 1390T portable GPS systems and review the navigation testing which I did with the unit. It is hard to report on how good or bad the unit is without some comparison of earlier and other manufacturer's GPS models. Each unit have their own good and not so good points but it is impractical to compare them all. So I'll try to limit any cross overs. 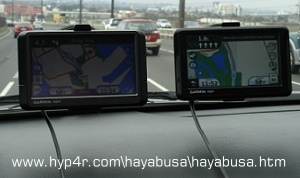 The Garmin navigation software that the 1390 and 1390T runs now is version 4.10 but the GPS software is actually version 4.30 which is the most current one available. The Bluetooth software is version 1.73. Using the 1390 or 1390T is still really simple, press the Where To? icon select the type of destination and enter in the details of the destination. There a variety of types or categories to choose from, like a home icon, POIs, recently found, junctions, cities or suburbs, and favourites. You can also browse the map and select on the map where you want to go. Point to a place and it displays the address details and anything of interest at the destination. If you've filled in the Ecoroute profile destination details include fuel costs. The calculation of the route takes a few seconds dependent on how far or complex it is to get there and that's it. The system analyses what you input as you type it in and offers a selection if it finds matches. The most noticeable change to the latest Garmin OS is the implementation of single finger 'kinetic like' scrolling 90% throughout the operating system. Basically instead of pressing the up and down buttons you just touch the screen then drag it up or down. It it fiddly at times on the icons but when it does work it works well. Although the menu responsiveness has improved, unfortunately the speed which the maps refresh when scrolling about has not. Route navigation options on the system have improved and include the avoid u-turn, traffic and car hare lanes. The navigation algorithm that the 1390 uses has been updated - however this is based on using the older GPS to see the difference. It could just be that the 1390 has updated map data compared to the older models. So far so good the 2010 Nuvi 1390T and 1390, work as advertised. The difference between the older 265W and 265WT models vs the 1390and 1390T are noticeable but not huge. If you are happy with a slightly slower system then go for the cheaper 200 series. If you want to go modding - which the 265 will now be used for, which is one of the reasons why I got the 1390T as second unit. One thing I noticed was that it had trouble with receiving satellite signals when in the city, specifically when not left attached to the window. Since the initial test was during a especially wet day I will update the page when the weather is not so overcast. Garmin have increased their online support with a variety of forums and knowledge databases over the last few years so any problems can be discussed openly? Their website is much easier and faster to work out then Tomtom or Navman. If trying to decide between the 1390 and the 1390T is simple. If you already have the Garmin GTM traffic receiver cable then the 1390 is the choice. If you don't have the cable but still want traffic data then the 1390T is the one to choose. Price range for mid-2010 for the 1390 and 1390T is clearly mid range, between $250-300 AUS.